I spent last weekend at a music festival in Whitecliffs, the legendary valley farm 100 km outside of Christchurch, New Zealand. I~Nation's line up featured the best kiwi talent in Jungle, Funk, Soul & Breaks, and Dubstep. Tiki Live was the mind blowing headliner, but I was struck most by Ladi6, one of Aotearoa's premier hip-hop artists. Ladi6 (Karoline Tamati) is one of the most casually stunning and rhythmic performers I've ever seen on stage. Her smooth deep vocals keep your mind in a trance and your body moving with a spicy beat. After much anticipation, on October 27th 2008 Ladi6 released her debut solo album "Time Is Not Much." 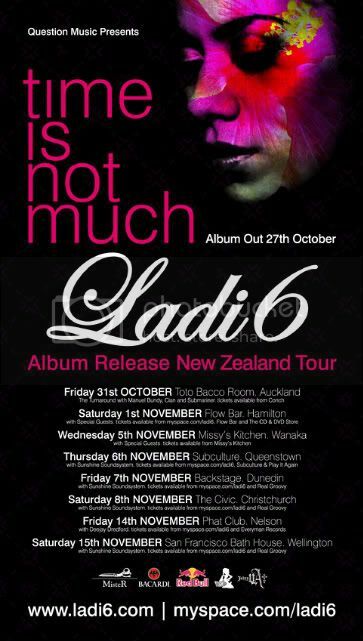 In wake of the successful album release tour, Ladi6 has earned herself the title of New Zealand's leading "soulstress and our Queen of hip-hop," (nzmusic.com/forum). Pay your respects at www.ladi6.com.